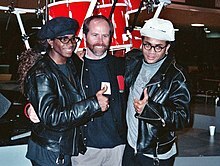 Fab Morvan (left) and Rob Pilatus (right) with NARAS President C. Michael Greene, February 1990. Milli Vanilli was a German musical group, formed in Munich. They consisted of Fab Morvan (born 1966) and Rob Pilatus (1965-1998). They were popular in the late-1980s. In 1990, people found out that the group never sang anything at all. Even at concerts, they pretended to sing (lip synching) while a recording was played. This page was last changed on 27 June 2018, at 15:24.